Orly's Pin-Up Collection contains 4 shades, 2 bright cremes (pink and coral) and 2 glitters. Today I have a look at the glitters for you, and if you like glitters, you're going to love these! Both of these covered very well using 2 coats, and the finish is relatively smooth. 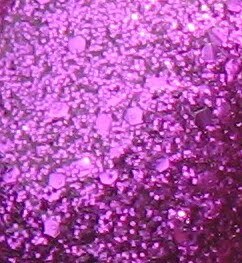 The foil glitter within these shades is a mix of micro glitter and hex glitter in matching colors. Bubbly Bombshell is a bright violet shade whose glitter is in a clear base. I expected that I'd have to apply about four coats to get acceptable coverage, but surprisingly, that was not the case. Here Comes Trouble, a lighter shade of Kelly green, has a green tinted base. I took these photos outside under cloudy skies, so I can only imagine their sparkle factor on a sunny day! Both of these shades had excellent coverage for glitter polishes, especially Bubbly Bombshell. 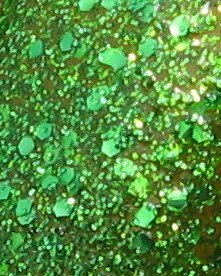 They have so much glitter in them, that after the first coat is in place, it gives the second coat a lot of texture to grip on to. That's my scientific explanation! There's plenty of sparkle to be found in these, that's for sure. i need the purple!! are these available now? Oh boy, I'm going to have to splurge on these! Great swatches. I was hoping it'd be a collection I could skip, but seeing these swatches I know I can't ;) Thanks for showing them! i saw these at Ulta two days ago i really wanted to buy but i had to pass them up! I like that the green has a greenish yellow base. Bubbly Bombshell is TO DIE FOR!! Must have! Wow, these are just as beautiful on your nails as they were in the preview swatches. I know what my next nail polish purchase will be! Is this out now?! I want! love them! specially the purple! I need to have that green glitter. 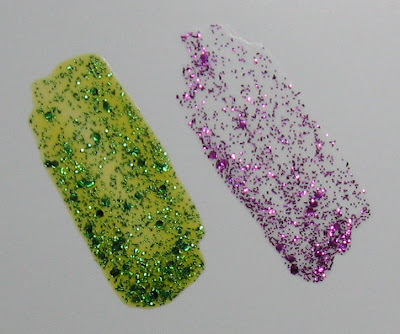 Wow, these are really interesting glitters! I'm impressed with these. Very unusual. so pretty! V.different from anything I own. I wonder if I can find these this weekend. Way too pretty to not get! I do love glitters. These are in my two favorite colors. Can't wait to buy these. I just bought Bubbly Bombshell. Its GORGEOUS!! But there is no base color, just clear with glitter... took me about 5 thick/thin coats... but worth it. oh Orly is going to ruin me ;) I've already ordered these glitters - SO AMAZING !